Have you heard about the Michael & Theadora, the “Ghost in the Morgue”, the “Girl in the Mist”, or the Lady in the Victorian lingerie in room 3500? Take the Crescent Hotel Ghost Tour to hear all of these tales….in “America´s Most Haunted Hotel” !! These tours sell out quickly, so do buy before your visit to Eureka Springs. The Crescent Hotel has been featured on SyFy channel’s TAPS. Experience a haunting first hand! Travel Back to an age of Intrigue during the Victorian era and witness an evening of incredible and mysterious demonstrations performed by an Illusionist and a Medium in the beautiful Historic Downtown Auditorium. The evening features special guests from the other side. 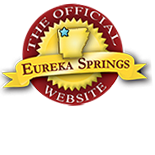 If you enjoyed movies like “The Illusionist” or “The Prestige,” you must come to Eureka Springs and experience the same atmosphere and performance as the movies LIVE! A one-hour, jam packed, keep ’em guessing, supernatural comedy-thriller. Not Really a Door begins with two women, each claiming that they are in their own house and the other is a ghost. Then things start to get complicated…. This is a 1-hr show and is recommended for ages 12 and over. From the edge of the roof to the chill of a dark limestone cave, hear about the tales to introduce you to “The Many Spirits of the Basin Park hotel”. Spirits of the Basin Tour, takes you to the roof of the 8-story Basin Park Hotel, then proceed by stages to the mysterious underground cave. On the way they you will stop at various locations to hear stories of the colorful characters who stayed, worked, died and perhaps remain. The tour includes a guided ghost hunt of the most haunted space and ends with a chilling ghost story told by candlelight and a sample of the bootleg liquor once served behind closed doors at the Basin Park Hotel. This entry was posted on August 10, 2016 by service424 in Attractions, Basin Park Hotel, Crescent Hotel, Family Fun, Ghosts, Things to Do, Weekday Getaway and tagged Eureka Springs, Ghost, haunted, hotel, intrigue, Paranormal, tours.